This Up-Rite adjustable desk mounted sit stand workstation instantly transforms your desk into an ergonomic work space. This unit also has dual monitor capability. This workstation clamps onto virtually any desktop giving you instant sit stand functionality. Sitting for six to eight hours a day is not ideal, and standing all day can be hard on you as well. By changing your position to fit your comfort level, you'll enjoy higher productivity, better posture, fewer energy dips, and a variety of other benefits. Get free shipping when you order today! 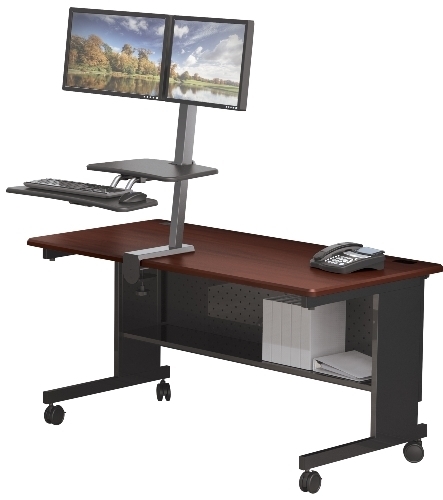 Easily attaches to your existing desk to give you 18" of instant height adjustability, retractable keyboard/mouse tray (27"W x 9.63"D), and VESA compliant monitor mounts. Ideal for use with either a laptop or a desktop computer and provides extra work surface (19.75"W x 12"D) for a tablet or other work materials. Includes 60" of cable management. Available with either a single or dual monitor mount. Single mount unit has a combined weight capacity of up to 15 lbs. Dual mount unit has a combined weight capacity of up to 22 lbs. BALT, Division of MooreCo, Inc., warrants to the original consumer/purchaser that the BALT furniture product line will be free from defects in material and workmanship under normal use and service. Should your furniture product(s) fail due to defects in material or workmanship, BALT, Division of MooreCo, Inc., at its discretion, will repair or replace the defective product at its facility, without cost to you, with the exception of shipping charges to our facility. BALT, Division of MoorCo, Inc., will ship the repaired furniture product(s) to the consumer/purchaser the best way, free of charge. BALT, Division of MoorCo, Inc., will provide payment for all shipping charges for defective/malfunctioning furniture product(s) within the first thirty days (30) of purchase. Proof of purchase is required. This warranty does not cover normal maintenance of the furniture products from BALT, Division of MooreCo, Inc., which is the consumer/purchaser's sole responsibility. This warranty also does not cover damage to the furniture products from BALT, Division of MoorCo, Inc., due to abuse, misuse, neglect, accident, modification of the furniture, water damage, or damage during shipping. BALT, ,Division of MooreCo, Inc., will advise you of the procedure to follow in making warranty claims. Contact BALT, Division of MooreCo, Inc., using the address or telephone number below. Please have ready your model number, description of product, description of defect, proof of original purchase, purchase name, address, area code and telephone number. PRODUCTS RETURNED TO OUR FACILITY WITHOUT A RETURN AUTHORIZATION WILL BE REFUSED. 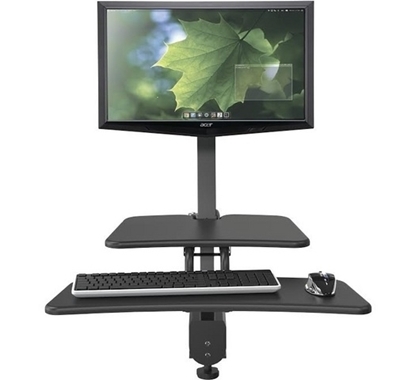 This single monitor up-rite desk mounted sit stand workstation instantly transforms your desk into an ergonomic work space, allowing you to sit or stand as you work. Sitting for six to eight hours a day is not ideal, and standing all day can be hard on you as well. By changing your position to fit your comfort level, you’ll enjoy higher productivity, better posture, fewer energy dips, and a variety of other benefits. Order today and get free shipping!